April 5, 2016 – Oracle announces the newest version of the Exadata platform, the Oracle Exadata X6. Back in 2011, we consolidated the full workload of four HP Superdomes and an analytics database onto one Exadata X2-8 with plenty of room to spare. At that point I became a huge fan of Exadata technology! In researching this article, I reached out to that customer only to find that they are still using the same X2-8 despite their increasing computing needs. After six years and many more Exadata implementations, I am still a huge fan. The Good, the Bad and the Awesome in five minutes. The Oracle Exadata X6 storage layer is now faster than EMC XtremIO. Since its release, EMC’s XtremIO has been in direct competition with Exadata. That might sound strange because XtremIO is a storage platform and Exadata is a database machine. 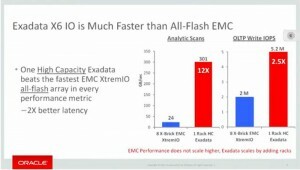 However, customers saw the performance advantage of XtremIO as a reason to forgo the Exadata DBM in lieu of building their own RAC databases, despite the other advantages of having a completely turnkey engineered system – advantages like Query offloading, Smart Cache and Hybrid Columnar Compression (to name a few). The dramatic performance enhancements of the storage layer in the Oracle Exadata X6 should make customer’s decision to embrace Oracle’s complete solution much easier. Cross-Generational Expansion. This simply means that your new Oracle Exadata X6 can be added extended into your existing X5 (X4, X3, X2) machines. This is particularly useful for large companies that have Lines of Business that are dependent or that crossover functionally, or for companies with projected growth that want to take advantage of the power of Exadata today while planning for tomorrow. For more information on Cross-Generational Expansion, and Oracle Exadata Multi-Rack Cabling. The price is the same as the Oracle Exadata X5. Given that the release date of the Oracle Exadata X5 was merely 7 months ago and the upside to the Oracle Exadata X6 (in comparison) is so vast, I imagined that X6 would be considerably more expensive than its predecessor. In fact, Oracle did not increase the price of the Oracle Exadata X6 at all, making it real a bargain compared to the competition. I would imagine that customers that are looking to make a change from the IBM P-series to Oracle Exadata would find this particularly refreshing. 7.2K RPM drives in the HC (High-Capacity) X6-2 configuration. While there is a lot of hype surrounding the Flash Accelerator F320 NVMe PCIe cards in the High-Capacity configuration, at some point the 7.2K RPM drives will begin to impede performance. The simple question is, “why not use 15K RPM drives?”. 10 Gigabit Network interface. 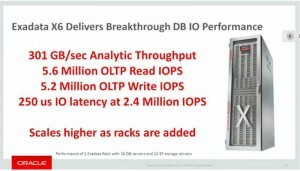 While the Oracle Exadata platform is making leaps and bounds within the confines of the physical Database Appliance (storage protocols & Infiniband connectivity), they need to start focusing on the performance in terms of standard external connectivity to prepare for the next generation of networks. Today, leading manufacturers are beginning to embrace the IEEE 100GbE standard, which is based on four lanes of 25 Gbps. Sounds great! The issue becomes, would Oracle have to expand the form factor to accommodate the additional hardware? Since Oracle is pushing the boundaries on performance, perhaps they should look at 25 GbE next? I could go on about the upside to the new Oralce Exadata X6 for hours, perhaps reach 2000 words and still not do it justice. With that said, I will focus on the 3 game changers I see for the product. Keep in mind, this will get technical. It is possible that this enhancement alone may bridge the gap for non-RAC ready applications to make the jump to a clustered database. It is definitely worth a call (to Oracle) to find out! Exadata Smart Flash Logging. Disclaimer: I am about to tell you that there is a database enhancement for applications that experience performance problems due to commit frequency. While this is true, adopting the technology solely based on this premise is not my intent. While this technology will certainly help your cause, you still need to address these issues within your application! There is a fine balance between the latency of log writes and user commits. Pressure on the log disk subsystem will cause commits to stack up, just as abnormally high commit volumes increase pressure on log write latency. It is the dance many high-volume applications engage in daily. It is also the cause of many sleepless nights for DBAs and COOs, because often there is not a simple solution. The good news is that Exadata storage (along with some help from the high speed RAM memory in the Exadata disk controllers) reduces the average latency of log writes, which in turn helps avoid the latency spikes. In applications where commit rate is a problem (and cannot be moderated by code changes) this feature could be a game changer. Exafusion Direct-to-Wire Protocol. This enhancement enables a process to transmit and receive messages directly over the Infiniband network avoiding the O/S and networking layers completely. Not only does this greatly increase the speed at which messages are transmitted, it significantly reduces the load on system resources making the Oracle Exadata X6 significantly more scalable. 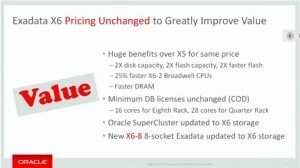 The Oracle Exadata X6 is a significant improvement over even its most recent predecessor. This generation of engineered system has elevated Oracle’s game to compete with (and outperform) EMC XtremIO in their own backyard (storage). Yet the Oracle Exadata X6s most impressive advantage is in Oracle’s commitment to continually making the product better. Excellent article with accurate details. We have done POC on Exadata X-5 as well as XtremIO. XtermIO has advantage over Exadata, if you need common solution for databases other than Oracle also! We saw Exadata wins just because of query offloading… a big win. On the other hand, I am also surprised that why Oracle is using 7.2K RPM disk instead of 15K RPM. That would be huge win. Also, external connectivity bandwidth could be a limiting factor or some organizations.